As recounted within the London Bridge section, Bricklayers Arms, which ultimately became one of the largest motive power depots on the South Eastern Division, began life as a terminus station. As a temporary measure to starve the L&GR of line usage rents, the SER and L&CR had received Royal Assent on 4th July 1843 for the construction of a spur which avoided the L&GR lines and London Bridge. Built under the auspices of the ‘’Bricklayers Arms Extension Railway’’, the station site was reached by a lengthy wooden viaduct, and came into use on 1st May 1844. Although inconvenient for those passengers bound for the City or West End of London, Bricklayers Arms succeeded in the capacity it was intended for: existing as a threat to the L&GR. The company was now at the mercy of the SER, and at midnight on New Year's Eve, 1844, the latter took out a £45,000 a year lease of the former. London Bridge may have reassumed its status as the SER’s main terminus in the capital as a result of the lease agreement, but it was not the end for Bricklayers Arms (which took its name from the local pub). Since the opening of the ‘’temporary’’ station here, goods facilities had always been a significant feature, and indeed, with the cessation of scheduled passenger services in 1852, these could now be further expanded. Moreover, months before the SER took out its lease on the L&GR, the company had already opened the first engine shed here. 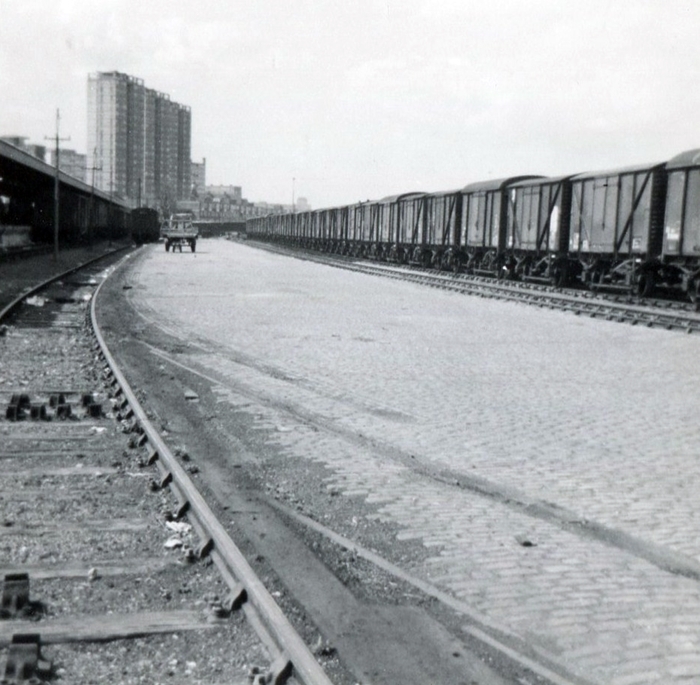 Continued expansion of the site under the SER provided no less than three engine shed structures, all of which accommodated four tracks each, and two of which were through affairs. Of the latter pair, these measured 270 feet and 210 feet in length and comprised one and two pitched roof sections respectively, of iron girder construction (these of which were very similar in appearance and construction to the trainshed formerly in existence at Deal). These would appear to be the buildings of 1844 origin. The third shed building, the longest of them all at 380 feet, was evidently a contemporary of the first four-road depot built at Ashford, for it was of all brick construction, demonstrated a single pitched roof for the whole of its length, and was frescoed with near identical brick patterning. However, despite Ashford being the home of the SER’s main works, its shed was considerably shorter than its counterpart at Bricklayers Arms, stretching for a length of 215 feet. Bricklayers Arms had sub sheds under its wing at Woolwich Arsenal and Deptford, the former having come into use with the North Kent Line in 1849, the latter being an original L&GR creation. They were joined on the sub-shed list by the five-road Cannon Street semi-roundhouse in 1866, which had opened with its namesake terminus, although was situated on the opposite side of the Thames to the platforms. In the meantime, the LB&SCR had also come on the scene, opening its own ‘’Willow Walk’’ goods depot along the Bricklayers Arms spur in 1849. This remained as a wholly independent operation from the SER site, and amalgamation did not occur until nearly a decade after Grouping. Bricklayers Arms’ status, at least on paper, was dealt a blow on the formation of the SE&CR in 1899; the LC&DR’s main engine shed at Stewarts Lane became the principle depot of the whole SE&CR network. Subsequently, it also lost its sub-sheds at Deptford and Woolwich Arsenal in 1904 and 1905 respectively, these closing on the advent of station rebuilds. Indeed, these small sheds had become obsolete with the commissioning of the sizeable depot complex at Slade Green in October 1899. The semi-roundhouse at Cannon Street had so far experienced considerable activity since its 1866 inception; a confined site, it had come in particular use for the SER’s tradition of reversing services from Charing Cross into the City terminus. Such engine manoeuvres had justified the provision of two turntables, one of which naturally served the roundhouse, the other of which was situated on the opposite side of the entry tracks. It would appear to be the SE&CR’s perpetuation of the SER’s Charing Cross service reversals which saw Cannon Street shed avoid closure during SE&CR suburban improvements around the turn of the century, other sheds on both SER and LC&DR lines having succumbed during this period. The Grouping brought significant improvements to the shed and goods yard complex at Bricklayers Arms, despite the rapid electrification of ex-SE&CR suburban lines under Southern Railway auspices. Regular scheduled third rail operation commenced to and from Charing Cross on 28th February 1926, the North Kent Lines becoming ‘’live’’ for the first time in May of that year – Orpington had received third rail in the previous year, by means of Bickley Junction. The electrification did ensure that Bricklayers Arms lost its last sub-shed, Cannon Street, the semi-roundhouse being flattened in 1926, its site partly being reused by a now familiar SR red-brick electric sub-station. By this time, the large suburban locomotive depot at Slade Green had been converted for EMU storage, and a then new heavy repair shed built to the south of the original brick building. As far as Bricklayers Arms was concerned, the first major alterations occurred in 1932, involving the amalgamation of operations of both ex-LB&SCR and ex-SER goods depots at the site (the former being the aforementioned ‘’Willow Walk’’). The following year was an interesting one, for it marked the opening of a wholly new depot within the triangular section of land at Hither Green. The shed here shared a significant characteristic with that at Bricklayers Arms: it was principally a freight depot, and later became home to numerous elderly SE&CR designs. The fact that freight haulage was reflected within both sheds’ locomotive fleets ensured that engine exchange between the two depots was frequent. In 1934, the SR instigated a programme whereby Bricklayers Arms would become the main South Eastern Division base for undertaking heavy maintenance and repairs on engines, large and small. Indeed, complete locomotive overhauls on this section of the SR’s network would still be dealt with at Ashford, which itself had received a brand new prefabricated concrete engine shed in 1931, but still utilised works buildings of SER origin. Subsequently, a large repair shop appeared at Bricklayers Arms, immediately to the north of the 380-foot brick-built engine shed. It was fed by two independent single-tracks, one of which emanated from the quite enormous turntable (designed to accommodate the largest of engines) situated to the north west of the through-affair engine sheds. Speaking of the latter, these structures were comprehensively modified by the SR in the 1930s, and by 1937, the 270-foot long engine shed had seen its pitched roof wholly rebuilt to exactly the same style as that which had featured at Hither Green Depot since its inception. The roof at Stewarts Lane had been similarly treated in 1934. With reference to the 210-foot long shed at Bricklayers Arms, this saw its roof rebuilt in the style still in existence on the surviving depot building at Tunbridge Wells West. These improvements were nearly undone during World War II, when bombing raids delivered significant damage to the area. After passing into British Railways ownership, Bricklayers Arms, like Hither Green, remained almost exclusively as a freight depot, but it still supplied engines for the small number of steam-hauled passenger services which remained at the ex-SER termini. 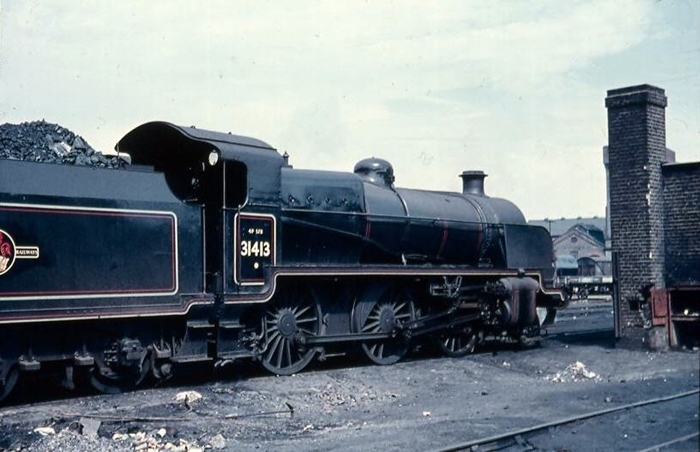 The Kent Coast Electrification and the dieselisation of the ‘’Hastings’’ line eliminated the final such steam diagrams, but of greater threat to the freight steam types at both Bricklayers Arms and Hither Green was the BRC&WC’s Type 3 (Class 33) diesel, the first of which had arrived at the latter on 4th December 1959. This diesel type soon began replacing steam on freight diagrams, and the year in which the last was completed – 1962 – also marked the closure of engine shed facilities at Bricklayers Arms. Both Ashford and Stewarts Lane remained open to steam traction for merely a year more. Although steam had now disappeared from Bricklayers Arms, goods traffic certainly had not. Furthermore, parcel traffic was concentrated on the site from 1969 onwards, mostly as a result of the closure of Southwark Depot in that year, this of which had handled such traffic since 1960. Like Hither Green, Bricklayers Arms managed to retain a working turntable beyond the steam era, it being a 65-foot example. This, a proportion of the original site structures, and numerous goods sidings, remained in regular use until the depot’s ultimate and final end; the whole Bricklayers Arms branch from North Kent West Junction was taken out of use in 1981, and the whole depot site was subject to redevelopment.